Kelowna Water Taxi & Cruises offers a first class experience aboard our 270 Searay SLX open bow design. With a deep planing hull, advanced Quiet Ride system and a great horsepower, you are ensured a smooth and comfortable ride in whatever conditions Lake Okanagan has to offer. Complemented by a spacious floor plan and luxurious seating, you will experience luxury cruising whether you are an intimate party of two or with a group up to 8. Guided by a Navman Navigation System with GPS tracker and operated by a Captain Certified by the Marine Safety Transportation Board of Canada itself, we have cemented our reputation as a reliable water taxi and cruise service. The Gael Force takes its cues from luxury automobile styling, the rakish profile and craftsmanship is apparent down to the last stitch. Cutting-edge technology is apparent with every turn, thanks to innovations like the Digital Dash and DTS steering system. Captain and passengers alike are treated to smooth, responsive performance and ample amenities like a swim ladder mounted beneath the swim platform for those who prefer not to just dive in or would have difficulty getting out of the water. There is also a bow and transom shower to wash off and beach towels to dry off after your dip. Cozy blankets are also supplied to extend day into evening in comfort. After all, luxury loves company. Seamless entertainment seals the ultimate relaxation experience. Good thing the Gael Force comes standard with the all-new AM - FM Clarion stereo system with six hull speakers, 2 rack speakers and 2 woofers. Sirus radio and iPod connection so you can set your own play list for the day. The stereo boasts an LCD display and transom controls for your convenience. All-day cruising requires all-day comfort and the Gael Force delivers the goods with an enclosed head compartment with lockable door featuring a premium porcelain toilet and stainless steel wash basin. Great social opportunities are enhanced by fantastic amenities for entertaining, the kind easily provided by the premium wet bar with a solid-surface countertop. This wet bar has your back when the crowd gets thirsty or needs sustenance! And the 12v refrigerator complements the stainless sink to keep your beverages and food chilled (all food and beverage to be supplied by you). To enhance your entertainment even more, the bow and the stern have removable tables and umbrellas, giving a shaded area to enjoy your food or drinks under a hot Okanagan sun. We also supply cutlery, plates and beverage glasses, beverage openers, napkins and hand towels. 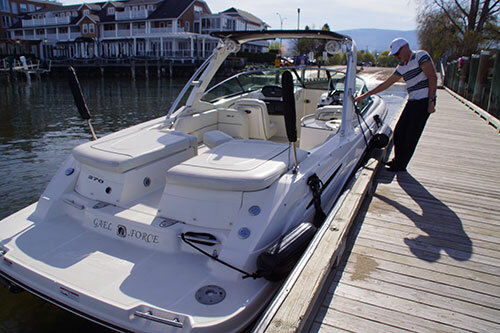 Our boat offers many comforts and features that enhance your Kelowna Water Taxi & Cruises experience!